Can you find your inner peace while riding an amphibious vehicle across a lake? I did. We've talked about Gibbs, the Auburn Hills-based maker of amphibious vehicles, a little bit here, and I've been trying to get behind the wheel of their Humdinga since I met some of their staff a few months ago. Maybe we'll get to the Humdinga someday, but instead I was offered the Quadski XL. My experiences with watercraft have been mixed. I went to a small Christian junior high school that, besides the education and stuff, was an outlet for students at Christian high schools to do community service with an added dose of Jesus. (Teach these kids to play soccer, but let's pray beforehand!) For a 7th grade field trip, we were paired up with such students for a canoe trip down the filthy Huron River in Ann Arbor. My canoe-mate was inexperienced, and somehow ours flipped over and we lost all our belongings. I also heard more swear words from a 17-year-old that day than whatever Master P song was popular at the time. I tell that story to emphasize that the water and I are not the best of friends. Boat trip? Fine. Speedboat? Yeah, sure. But the closer I get to the water, the more I freak out. So when you ask me to try this mythical beast of an amphibious vehicle in a deep body of water, it'll take me a minute to get my bearings. An amphibious, soft-roading personal watercraft isn't going to be the prettiest thing in the world, but Gibbs makes it work. Up front, flared fenders. In the back, a little more square. Part of me sees the Pontiac Banshee, and the other part sees a bulky Kawasaki Ninja. It's not ugly, though. I rode a bright-green one, and it also comes in camo, silver, yellow, red, and a blue not unlike Volvo's Polestar blue. They're pretty attractive in the right shades. Er…well…there's not really an interior. Gibbs has been making Quadskis for years, but the Quadski XL out this year is the first two-seater. My biggest worry is that because the vehicle is so wide, your legs would be stretched too far while straddling it. Not the case; it was entirely comfortable. The controls are pretty straightforward and standard, with a typical odometer in the front with a digital display. The brake and throttle are both on the handlebars. If there's one cool thing of note, it's that the hull is made of a lightweight material that makes it easier to toss around water but still keep riders stable. We were told the Quadski XL can go up to 45 mph on land and on water. For comparison's sake, a personal watercraft averages around 65 mph. I'll get to why the Quadski still measures up in a bit. Gibbs uses BMW's Motorrad K1300 water-cooled inline-four motorcycle engine, getting out 140 hp and 87 ft.-lbs. of torque. It's rear-wheel-drive with a sequential gearbox. On land, the Quadski XL has a not-bad 8.6-in. of ground clearance. (A Jeep Wrangler can get up to 10.2 ins. of ground clearance.) But we didn't have much land to hoon on, as we might piss off the country-club folk playing tennis. From what little we did have to play on, though, the ride was OK. Here's the amphibious part of the ride works. You'll have to ease into the water slowly, around 5 mph. As much fun as it would be to blast off from land into water (or vice versa), you might actually die doing that. So the transition has to be easy. Once you ease off the shores, you have to wait until you feel some buoyancy under the Quadski. The wheels will still touch the ground, but once the hull begins to wobble side-to-side, you're ready. Getting the wheels up for water mode is a one-button, five-second process: Hold down the handbrake while pressing the button, and a beep will let you know when the wheels are up. 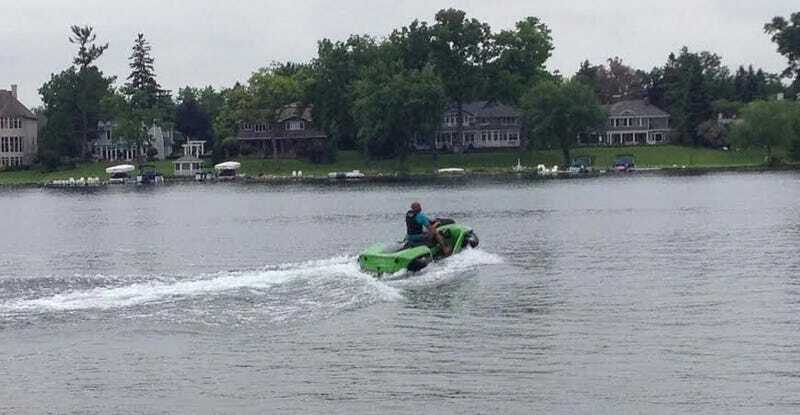 The key to this, though, is that you have to keep the Quadski moving right up until you're ready to get the wheels up and get it going again almost immediately after the job is done. This was admittedly tricky for a few of us; instinct tells you to go into the water, stop!, then let the wheels up. Nope, it has to be continuous motion. And it's easy to master after a few tries. The throttle on the Quadski XL is extremely sensitive. So, if I'm trying to crawl in the water at 5 mph, I have to have a soft touch. That said, you forget all about it when it's time to go. On my first ride, I ease into it to get myself used to the buoyancy. You're high up from the water but you're still damn close to it as well, and all I can think about is "this thing is going to flip over like the canoe in 7th grade." It didn't. And it never did. That sensitive throttle kicks in and I'm up to 45 mph in no time. It's still a little frightening, because we're pulling further and further away from the show. But…I like it? And I've got control? Full control? And suddenly, you're doing it. The waves were a bit choppy, so my first instinct is to slow down when approaching one, ride over it gently, and get back going. I did notice that the gearbox gets sluggish in the lower speeds when you do this, sometimes frustratingly so, but you can't get too upset with that once you hit your stride again. There was a moment when I stopped paying attention to the odometer, looked up and saw nothing but blue. Blue skies, blue water. It was cloudy, but the sky had just opened up. And the water had calmed for this particular stretch. I'd hit top speed, the breeze was just right. The engine, which is tuned here to be a bit softer than its motorcycle counterparts, isn't that loud, but at this moment it was just background din. It was almost zen-like. And then you start hitting those waves again and realize how much fun it can be. They told us to be careful of the waves, but after some time out on the lake, I stopped slowing down from them; I wanted to see how fast I could take them. And each time I bounced higher off the waves, challenging myself to see how high I could go. The Quadski XL is not an easy vehicle to turn when you want to change directions, and that's fine — because you throw it sideways instead. The Gibbs people kept saying the top speed was 45 mph. That's a lie. Once I was in my element, I was pushing almost 60 mph. And that's fine. All the more fun. The one drawback is that there's only about an hour and a half of battery life, which is fine unless you're planning to cross the Atlantic. After I first got off the Quadski, I tweeted that I found out what I'd been missing in life. I wanted to jump off and say "I AM POSEIDON, KING OF THE SEAS!" after having dominated this little lake in a rich suburb. But damn, was it fun. The Gibbs people let me ride again for a little while longer, and now I'm just sitting here thinking of how I'm going to get one. The regular Quadski is in the $40,000 range and the pricing for the XL, which I rode, hasn't been announced — though we'll guess it won't be too far from there.